NES Metal Gear (USA) in 22:35.93 by dunnius. 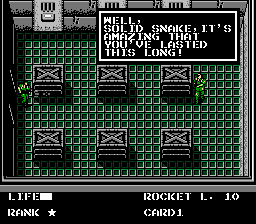 This is the NES port of the first entry in the ever-popular Metal Gear series of stealth video games created by Hideo Kojima and developed and published by Konami; there are significant differences between it and the original MSX version. It is infamous for its engrish, containing such ever-popular phrases as "I FEEL ASLEEP!" and "UH - OH! THE TRUCK HAVE STARTED TO MOVE!". This movie utilizes quite a wide variety of game glitches and collects the minimal set of items needed to complete the game. This movie is a 19.23 second improvement, due primarily to an extra death warp; it also contains several smaller improvements.